ChromSword | HPLC Method Development ChromSwordAuto | REQUEST for Information/Demo ChromSwordAuto | What is it? ChromSwordAuto | Main Features ChromSwordAuto | Typical Samples ChromSwordAuto | How does it work? ChromSwordAuto is equipped with "Intelligent Peak Tracking" function, which ensures a reliable peak assignment even in compund mixtures containing impurities. This is even achieved without the need of DAD spectra. 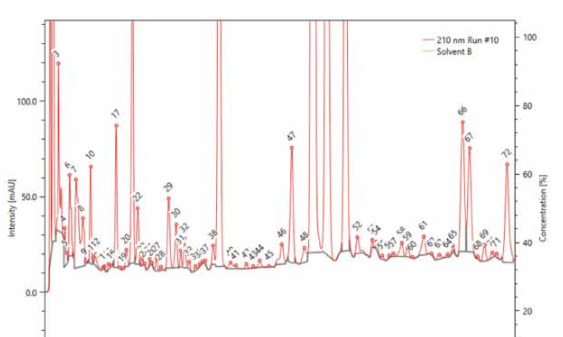 The system ensures that all peaks are clearly isolated and optimized, regardless of how many compounds are present in the mixture by recording and tracking the peaks that emerge under different chromatographic conditions.